Here is an interesting fact: the Chevrolet Equinox became the brand’s second best-selling vehicle in 2015, right behind the Silverado pickup truck. This is one fact that no one saw coming. Actually, the Equinox’s success was a byproduct of the rising tide of crossover/SUV sales. In the past couple of years, crossovers and SUVs drove a wave of sales above all other types of vehicles. In some cases, they have become the best selling product for the brand. Sometimes, they could be the second-best selling product, backed by a huge uptick in volume from the year before. The latter was the case for the Equinox. It took five years for the Equinox to achieve this status in the Chevrolet family. For 2016, the Equinox received a long-awaited refresh. When the dictum from the brass calls for “if it ain’t broke, don’t fix it,” it is time to make some changes. Chevrolet did not just do a nose job and a few other trimmings, it went further. The result so far was continued sales growth. Therefore, with a 2016 Equinox LTZ to evaluate, I had to see these changes for myself. To start with, the current body shape dates back to the 2010 model. It has served Chevrolet well, with its right-sized body, angular roofline, and accommodating access to two rows of seats and a huge cargo hold. Even with all-wheel drive, the ground clearance looked quite low for its class. You can perhaps call this “civilized,” and rightfully so. Perhaps, civilized is another way to affirm its popularity. While it is a distinctive shape, there are a lot of Equinoxes out on the road…and in the parking ramps. What makes this 2016 model more distinctive is its new front clip. This embodies the shape of a new grille design for select new Chevrolets, namely the 2016 Malibu. The shape is sharper, with the lower grille sporting a wider grin above the horizontal bar and the upper grille. Headlamp units now sport better illumination with a cleaner housing and lens. The rear end now sports new taillight lenses with LED lenses and a chrome trim across the “handle” of the tailgate. New trim pieces and wheel designs round out the 2016 updates on the outside. Inside is practically the same as in 2010. The changes for 2016 are subtle, but they also house some very important updates. For example, The MyLink touch screen has grown to seven inches, and houses many more connectivity functions than before. This includes the OnStar 4G LTE Wi-Fi connection and improved streaming app playback. SiriusXM and HD radio are also part of the infotainment options. This Equinox LTZ had a navigation screen with improved graphics, as well. The rearview camera was better integrated onto the new larger screen. Pioneer provided the sound for this LTZ tester, including a subwoofer for that bass groove. What has not changed is its heritage-based instrumentation binnacle. Think of an old Camaro or Corvette with its two dial pods, split by a modern information screen. Switches remain the same, as well, with information screen functions controlled by a few buttons on the center stack. I used to complain about the setup on the Equinox and GMC Terrain (which shares the Equinox’s platform), but over time, you get used to it. One complaint however: the steering wheel switches are not all great to the touch; in particular, the roller switch to change station presets. It’s really just one switch. Where the Equinox will win you over is in accommodations. The seats are large and very comfortable. 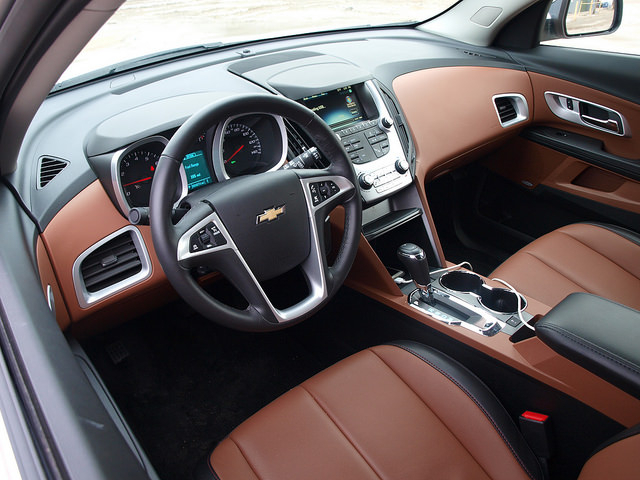 This LTZ sampler came with a two-tone leather combination of Saddle Up and Jet Black. This combination is tastefully done throughout the cabin. If you love being up front, the rear seat is also fantastic. Not only is it comfortable, it is also adjustable. You can push the seat back and recline them for the best rear seat room in its class. Cargo space is also accommodating, expandable to 63.7 cubic feet with the rear seat down. 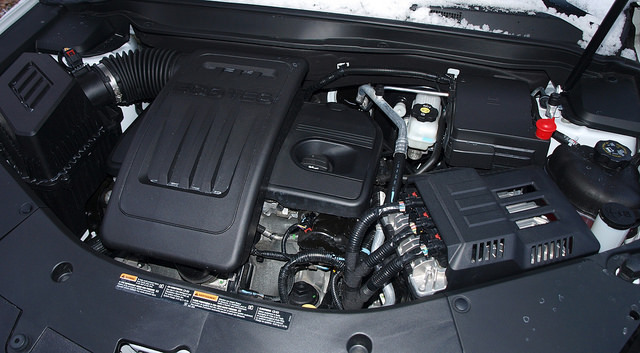 The Equinox comes with a 2.4-liter Ecotec four-cylinder engine standard. This 182-horsepower motivator not only soaks up the miles, but returns decent fuel economy. My fuel consumption average came to 25.3 MPG. The four-cylinder engine was set up with a six-speed automatic transmission and an all-wheel drive system; a very good setup overall. Front-wheel drive is standard on the Equinox. If you need more power, a 301-horsepower 3.6-liter V6 is available. Choose this and you can tow up to 3,500 pounds. Driving the Equinox was indeed a good experience. First of all, it is quiet. Not many of its competitors can truly say that. It makes things a lot easier to live with having a quiet vehicle to drive. It also rides very smoothly, though cornering will reveal some roll and lean. Handling and control is pretty good, too. Braking is also good, with good stopping distances in normal and panic situations. Winter conditions are no problem, especially with a good anti-lock braking system on board; however, the steering simply felt numb. The on-center feel was a bit light, yet there was adequate response when turning and tight maneuvers were achieved just fine. 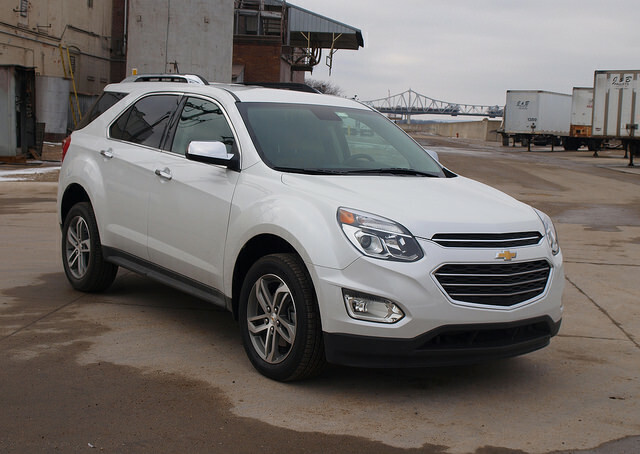 Equinox models start off with a value model, the L, equipped with the four-cylinder engine and front-wheel drive. The base price for the L is $22,600, which is about where every one of its competitors have their pricing at. You can get something along the lines of this LTZ tester with all-wheel drive and the four-cylinder motor, coming in with a sticker price of $35,355. 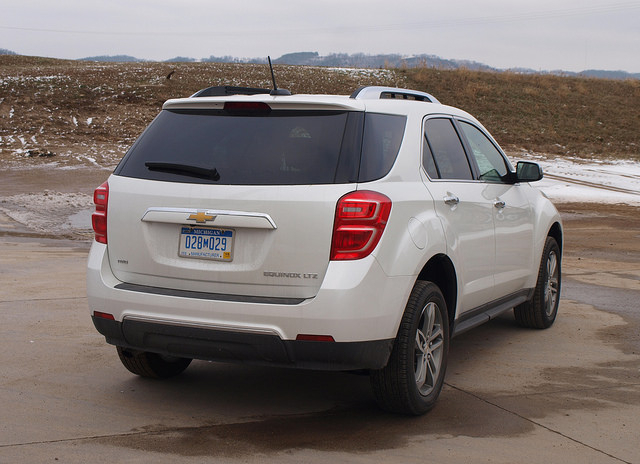 There are plenty of vehicles in this class worth considering; however, the Chevrolet Equinox offers a lot more to consider than the rest of the compact crossover/SUV segment. Perhaps one look is right on your block or apartment complex ramp. There is quite a bunch of us who own this wonderful vehicle. We obviously love them for the same reasons why many other Chevrolet customers have been buying them: the cabin/cargo space, good performance, and a solid reputation for being a good vehicle. To dismiss the Equinox as being “too old” would be to deny a chance to consider it for your next vehicle. Just like those who who are aging, we’d rather simply be called “mature.” The Equinox is not just a mature vehicle, it still does the job very well.